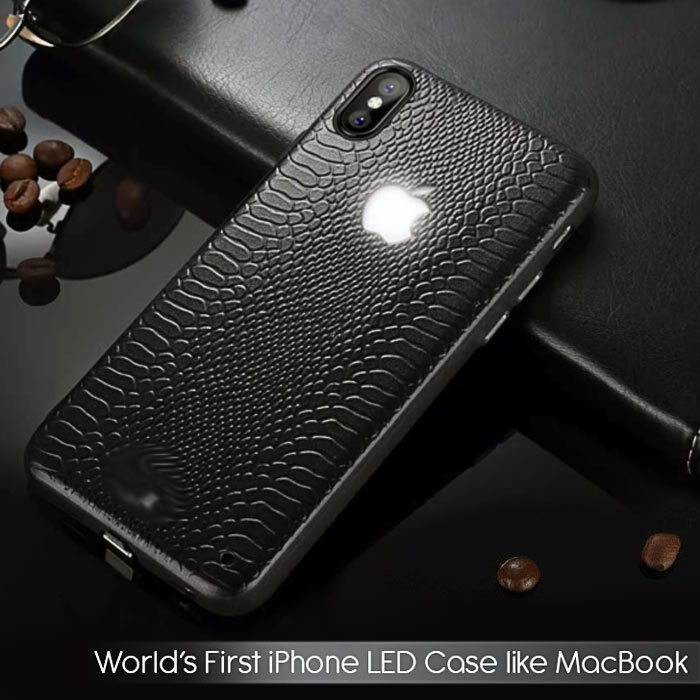 Groot iPhone LED Case has has a MacBook style Glowing Apple Logo case has a Stylish embossed pattern , non-slip, scratch resistance and anti-fingerprint. Designed with PC back shell and TPU bumper, anti-abrasion and shockproof. Apple Logo keeps glowing when the power connector is on, you are the focus in the crowd. Snake skin style embossed patterns make it ultra stylish in day time with a contrasting white apple logo. Raised edges protects iPhone from all sides from occasional falls and drops. Precise cutouts allow full access to all ports, buttons, controls without removing the case. Comes with strap hole, can attach a lanyard for easy carrying. Best part is, this case is Wireless Charging Compatible and protects your lightning port from dust. The Glowing Apple Logo Case is made up of Electroluminescent light that has very less power consumption. The light automatically turns off in 10 seconds when the phone is not in use. Electroluminescent is an optical phenomenon and electrical phenomenon in which a material emits light in response to the passage of an electric current or to a strong electric field. This Glowing Apple Logo Case is truly Awesome. YES! A glowing Apple logo case for iPhone is finally here. The Glowing Apple Logo Case from GrootGadgets.com is all you need to light-up your iPhone. All you have to do is to put this case on the back of your iPhone – plug it into the iPhone’s lightning port and let there be light. The light is made from new latest technology that hardly requires any battery power. So don’t worry about the battery life of your iPhone, it consumes negligible amount of power. The main focus here is the light up Glowing Apple Logo Case like on MacBook, which is worth every penny you pay. You’ll know that when you are out in the evening and every eye will be on you (I mean on your iPhone). Be ready to tell people where you got the case from, as many people might be walking to you in desperation for knowing how they can also lit up their iPhone. Enjoy!